A fully welded angle iron cages infilled with metal strip giving you robust and secure storage. 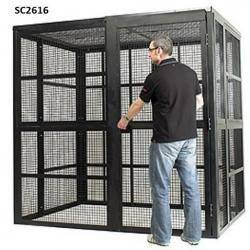 These complete security cages have hinged pad-lockable doors (padlocks not provided). 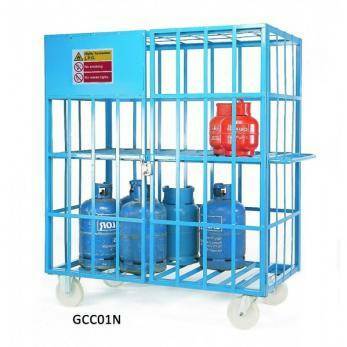 This cage will carry a maximum of 16 calor-gas type cylinders and with its mid level shelf boasts 2 generous internal spaces of 1560mm x 840mm x 720mm (WxDxH). Available with either stove enamel blue paint or galvanised finish ( Premium applies). Sturdy 200mm nylon castors can be added in this case push handles will be added at one end.